Fortunately, it is possible to repair earlobe piercing holes that have been stretched or split. During this procedure, Dr. Hirsch will repair the edges of the split by first trimming the edges of the split, and then repairing them with a zig-zag pattern in order to minimize the chances of notching at the edge of the earlobe. The procedure itself is performed under local anesthestic, and it is usually not necessary to go to the operating room. Dr. Hirsch performs this procedure at his office in Sherman Oaks, a few minutes north of downtown Los Angeles. 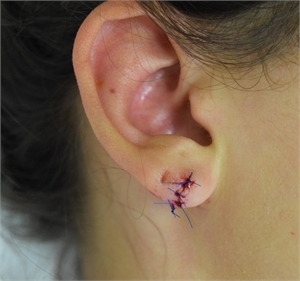 Sutures are placed that may be removed in one week and then in a few months, the earlobes can be re-pierced and earrings can be worn again! 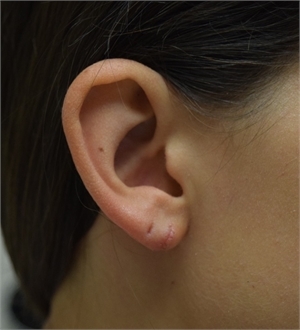 The following pictures and video illustrate Dr. Hirsch's preferred technique of split earlobe repair for patients in Los Angeles. 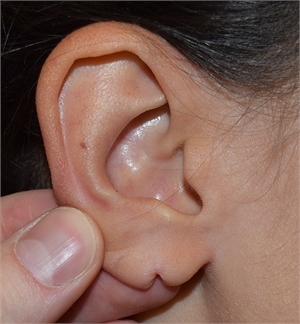 This picture illustrates a typical split earlobe. This Los Angeles patient used to wear an earring, but it was pulled through her earlobe some time ago. She has not worn an earring since her injury. 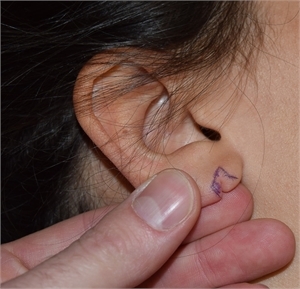 After numbing the earlobe with an injection of local anesthesia medication, the marked area is removed with a scalpel. Patients only feel the first injection, the remainder of the procedure is virtually painless! The earlobe is then repaired with suture, starting at the bottom edge of the incision and extending to the front and back of the earlobe. These sutures stay in place for a week, and then they are removed in the office. The sutures have been removed, and the incision is healed! In a few months, this patient will be able to wear earrings again. How long until I can re-pierce my ears? In general, you should wait 6 weeks for the scar to be completely healed before you re-pierce your ears. This is important because if you pierce your ears before the incision is fully healed, the earring may pull through the incision and you could end up with a separated earlobe. Can I re-pierce my ears in the exact same place as before? In general, it is better to re-pierce your ears in a slightly different place than the original piercing hole. The reason for this is that the original piercing hole is within the new scar, and the scar is never as strong as normal, unscarred skin. Placing the piercing hole within the scar can lead to the earring pulling through the scar and a repeat split earlobe. I used to wear “ear plug” type earrings, but do not wear them anymore. Now, my earlobes are stretched and there is a big hole in them. Can this be repaired? Yes, repair of earlobes that were stretched by “ear plug” type earrings can be done. The repair of stretched earlobes involves cutting off some of the extra skin, and rotating it to the other side of the split so that the ear lobe looks as natural as possible. The procedure can either be performed in the office or in a minor procedure room. As a plastic surgeon in Los Angeles, Dr. Hirsch also offers breast augmentation, breast implant revision, breast reduction, and liposuction.